Signature of the collaboration agreement between ADI Nouvelle-Aquitaine, Logévie, Life Design Sonore and Aude de Foucher in the frawework of the ICT4SILVER project. Neew’we product in Logévie residencies. Logévie is a social landlord specialized in elderly residencies. Newee is a solution that enables to broadcast sound trough furniture’s. It can broadcast any kind of audio sources with a wireless connection. In the Logévie Residences, they have integrated this solution into pillow for an individual use and in sofas and petals for a use in the common room, designed by Aude de FOUCHER. 3 residences have been selected to test the solution, in Mérignac and in Cenon. One residence in Cenon, is an intergenerational one and gathers both young and elderly people in the same building. 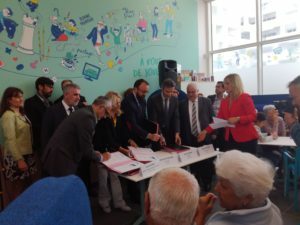 On the 25th of April, the official inauguration of the residency hosts the signature of the collaboration agreement between our organization and the companies in the framework of ICT4SILVER project. In fact, the 3 companies have been selected following ICT4SILVER expression of interest to be supporting in the development of this technology thanks to a usage study. This study has been defined by Autonom’Lab, our partner for this part of the project. It will evaluate the user experience using the devices and identify the improvements needed for a better use. The experimentation has started in the beginning of April and will last until June. The results will be shared in October 2018.